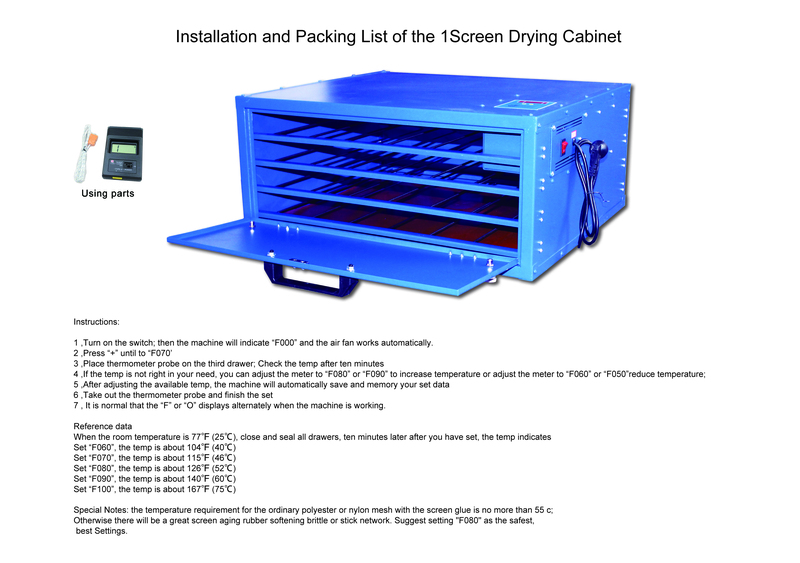 1.Dry the finished screen frame after the degreasing and cleaning. 2.Avoid light drying the screen frame that finished the emulision. 3.Dry the finished screen frame that finished cleaning.The machine adopts new classification temperature control technology. 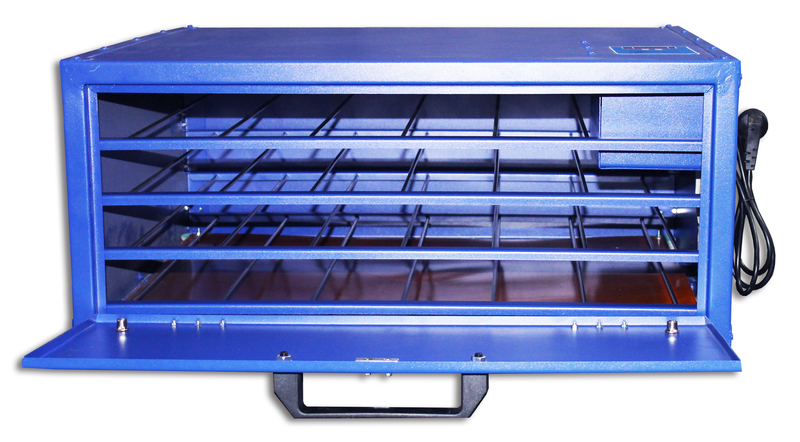 According to the requirements of the mesh and screen glue to control the temperature in the oven for 40-70 degrees ; After the temperature setting ,it will be automatic memory and ensure the constant temperature in the cabinet. 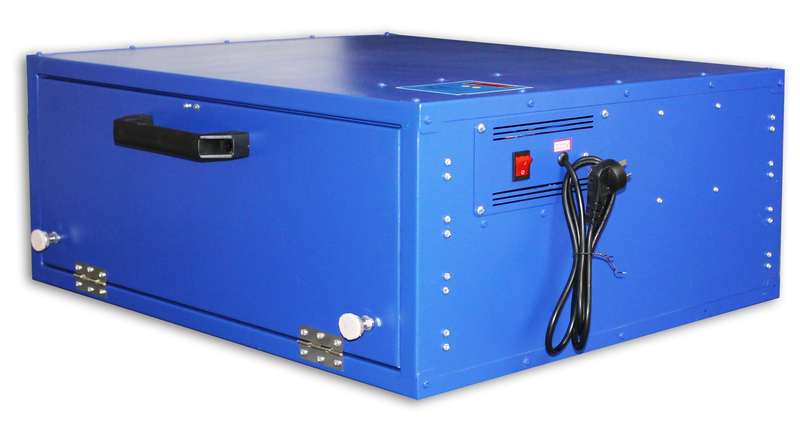 1.The machine adopts the safest, the best technology plane of the carbon fiber heating plate, sheet of the heating and temperature more uniform; The heating plate use environmental protection material of epoxy resin, resistance to water, oil, pulp, it can be scrubbed, easy to clean; If body touch the bad part of the heating plate, no leakage takes place, at the same time it also won't affect use. Normal service life is more than 10000 hours. 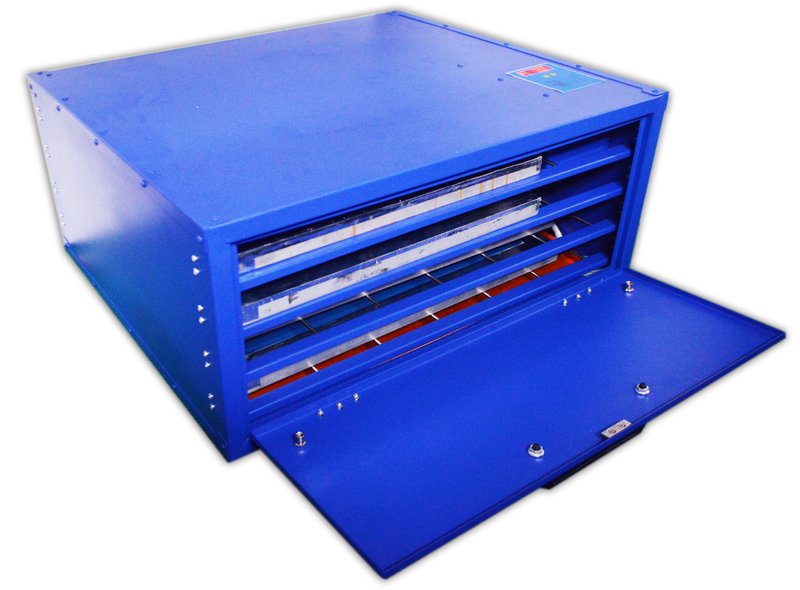 2.Installed the silent axial flow fan in the cabinet to make the circulation of the hot air in the cabinet, and it can make the temperature in the cabinet to be the same. The fan can be normal used more than 10000 hours. 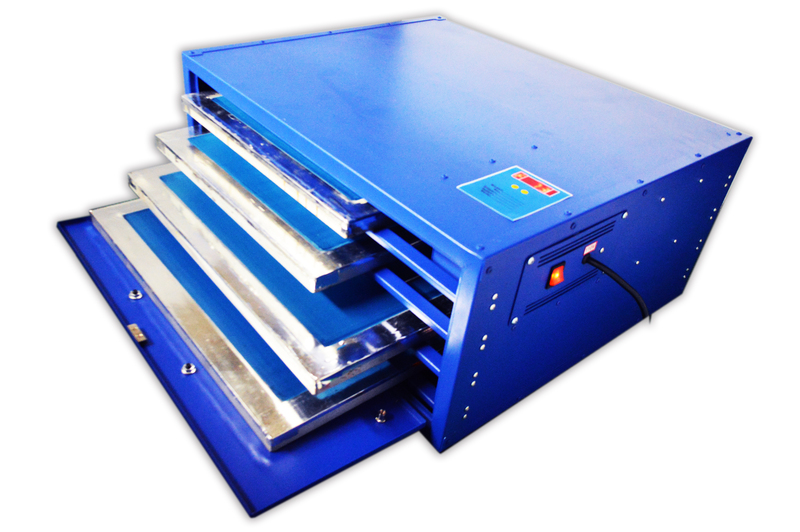 3.Four shelves design, this machine can place 2 pieces screen frame with od 62*58cm at the same time ;2 pieces od 55 * 58 cm. 4.The machine adopts CNC processing, ensure the body sealing and be away from light. 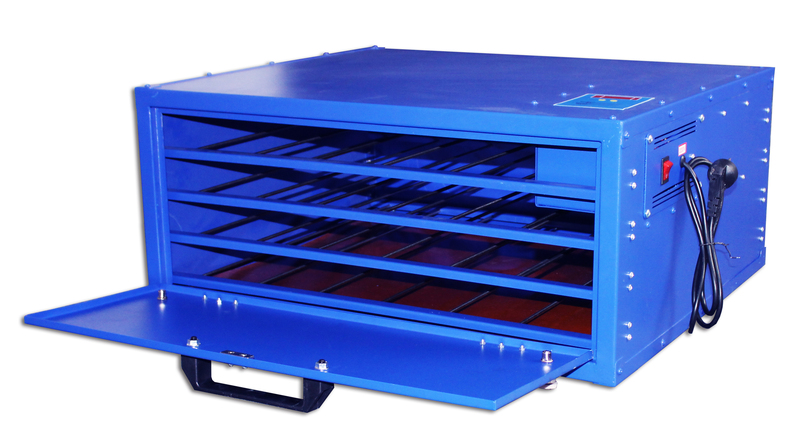 5.The total power of the machine heating plate is 800 w, after setting the temperature, the machine will turn on automatically according to the set temperature, power application, more energy saving province electricity; it is more energy-saving than others. 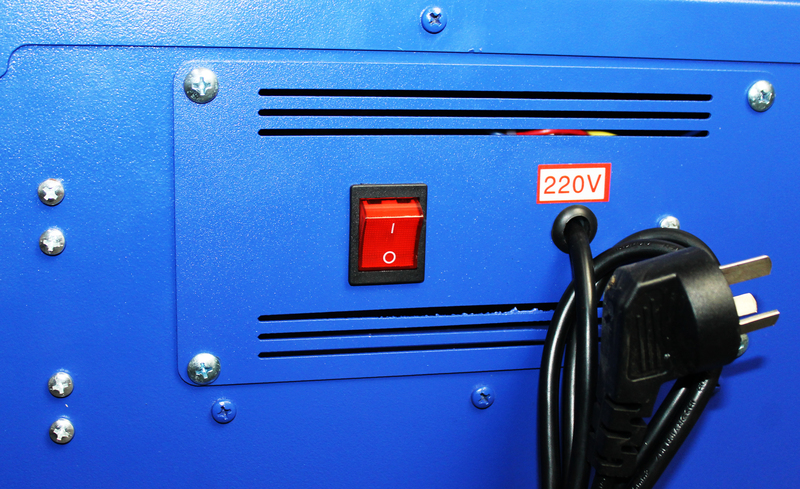 1.Turn on the switch; then the machine will indicate “F000” and the air fan works automatically. 2.Press “+” until to “F070’ . 3.Place thermometer probe on the third drawer; Check the temp after ten minutes. 4.If the temp is not right in your need, you can adjust the meter to “F080” or “F090” to increase temperature or adjust the meter to “F060” or “F050”reduce temperature. 5.After adjusting the available temp, the machine will automatically save and memory your set data. 6.Take out the thermometer probe and finish the set. 7.It is normal that the “F” or “O” displays alternately when the machine is working. When the room temperature is 77F(25C), close and seal all drawers, ten minutes later after you have set, the temp indicates. Special Notes: the temperature requirement for the ordinary polyester or nylon mesh with the screen glue is no more than 55 c; Otherwise there will be a great screen aging rubber softening brittle or stick network. Suggest setting "F080" as the safest, best Settings.